New Orleans is still struggling to cope with the after-effects of Hurricane Katrina — the costliest hurricane in US history — more than 3-1/2 years after the tropical cyclone hit. Nearly every levee in the metro area was breached as a result, leaving 80% of the city underwater. More than 2,500 people were killed or remain missing and more than 1 million were evacuated from the Gulf Coast region. 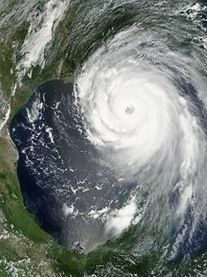 A storm surge driven by Hurricane Rita flooded the city again three weeks later. Estimated total monetary damages so far: $89.6 billion. City government is embracing energy efficiency, conservation, “green” building standards and renewable energy alternatives as it strives to revitalize the “Big Easy,” and the Dept. of Energy and its National Renewable Energy Lab are playing a key role in the effort. 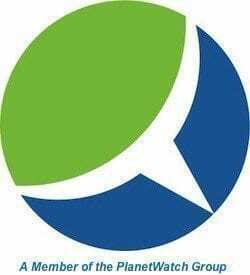 Executives from the DoE’s Office of Energy Efficiency and Renewable Energy and NREL established an office in the city to promote energy conservation and the use of renewable energy systems in the city’s rebuilding plans. Working with municipal agencies and private contractors, the DoE-NREL team is helping build affordable, energy efficient homes with features such as rooftop solar panels, extensive insulation and more efficient climate systems, “green” building standards that are to be applied citywide in schools and hospitals. 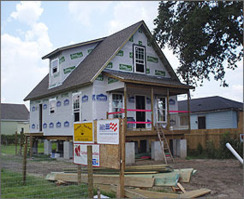 As part of its Building America program, the DoE has challenged the homebuilding industry to build 220,000 high-performance homes in New Orelans before 2012. Hiring local staff as well as seconding employees from its headquarters, the DoE/NREL team has advised two dozen organizations working to rebuild and help the city recover. NREL is working with Building America partners such as the Florida Solar Energy Center and Building Science Corp., homebuilders such as Habitat for Humanity and charities such as Catholic Charities to design and build affordable, energy efficient homes. The first group of four two- and four-bedroom homes certified as meeting criteria set out in the Building America program are being built in the Gentilly neighborhood as part of Project Home Again, a philanthropic program established with Green Coast Enterprises and the Leonard and Louise Riggio Foundation. Sixteen more are due to be completed come spring and the partners are looking to expand the program to 100 or more. All are reserved for qualified, low income neighborhood residents who lost their homes as a result of Katrina. Designed to reduce energy usage 30-40% and reduce utility bills by as much as $1,000 per year, the energy efficient homes include passive heating and cooling, “daylighting” with “low-E” double-hung, double-glazed windows, whole house insulation using high-density spray foam, Energy Star appliances and lighting, and foundation piers to elevate houses above the flood plain. NREL and the DoE have also joined with the Orelans Parish school district to use an Integrated Design approach to rebuild schools. Only 84 of the 128 schools open in the district prior to Katrina are expected to re-open over the next 10 years. The rebuilding and renovation effort is projected to cost almost $2 billion. Four new schools under construction will be 25% to 35% more energy efficient than code requirements stipulate. That’s set a standard that has now been written into the school district’s master plan. The DoE and NREL have also worked with city officials to create the “Energy Smart New Orleans Plan,” which includes financing for energy efficiency improvements in homes and small businesses, low-income weatherization, a pilot solar thermal and PV component, and a contractor training and certification program. The state government is offering a 50% residential tax credit on the first $25,000 of the cost of an installed rooftop photovoltaic system as an incentive. NREL is also looking to persuade local utilities, public officials and central business district leaders to take the steps necessary to integrate power generated by distributed PV systems into the local electricity grid. NREL senior project leader Phil Voss recently spent 18 months in New Orleans helping get these programs up and running. It’s the first time NREL has sent a staffer out in the field to participate in such a project.